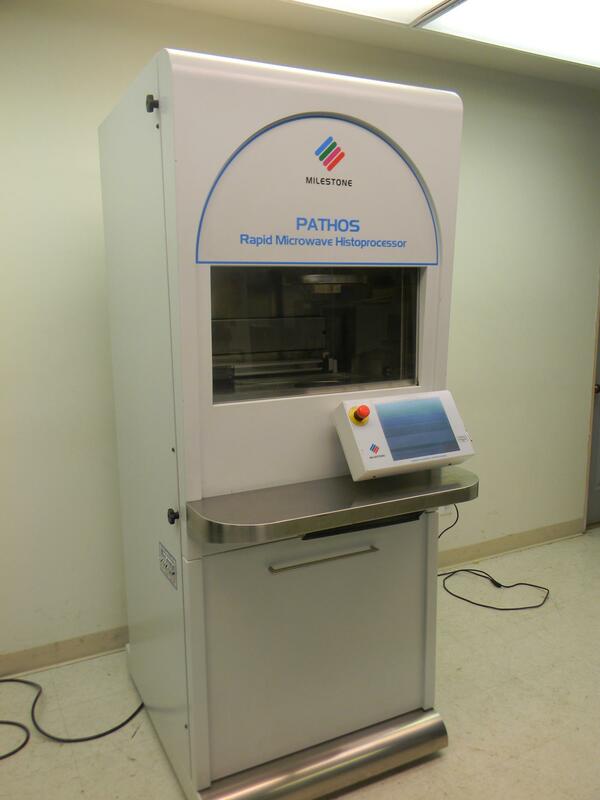 Milestone Pathos Rapid Microwave Histoprocessor Automated Tissue Processor 62060 . New Life Scientific, Inc. The PATHOS is a must have for any lab that needs to quickly process a small or large number of various tissue samples simultaneously with minimal effort required. The PATHOS has two separate cavities, one for reagents and one for wax. The separation of these cavities minimizes cross contamination and prolongs the life of the reagents and wax. There are 12 reagent bottles total, including 6 permanent rear bottles and 6 easily removable front bottles which can be filled and used to transfer reagents to the rear units. The PATHOS comes with a built in back up power supply and alarm system to ensure that the necessary procedure is taken if you lose power in the middle of a tissue process. The Milestone PATHOS rapid microwave histoprocessor is in great cosmetic and functional condition. A technical review has been performed internally and externally, noting any damages or repairs required. Please note that there are multiple instruments available and you may not receive the exact serial number in the gallery. The technicians installed new magnetrons and performed power tests. The results were within an acceptable range and the touchscreen interfaces were accessible for controlling the instrument. There is a quantity of processors available and not all required a magnetron replacement. New Life Scientific does not stock consumables (paraffin) or reagents (formalin / Milestone Solutions), but has extensive experience with Milestone, Leica, Sakura, and Shandon histology equipment. Please contact us for more information about testing or with any requests regarding this Milestone Pathos.